A team of researchers across disciplines at Carleton University is working on an international project with China that has the potential to change the whole concept of wastewater treatment in an environmentally acceptable manner. With more than half a million dollars in funding over three years, the Ontario-China Research and Innovation Fund (OCRIF) partnership will allow scientists in China and in Canada to refine the technology and the equipment required to treat non-biodegradable organic wastewater with supercritical water oxidation (SCWO) and to test it at a pilot plant in China. The project is one of the first for Carleton University under the Ontario-China partnership program. Ultimately, by eliminating some of the kinks in SCWO processes, the researchers hope to commercialize the technology on a large scale, in order to solve heavily contaminated water and sewage sludge discharged by hospitals, municipalities and such industries as pulp and paper, mining and petroleum. The local team is analyzing data, organizing models and evaluating the performance and cost-effectiveness of the system for different samples and scenarios, thus establishing operational parameters such as temperature, pressure and oxygen demand. Meanwhile, the Chinese researchers, funded by their ministry for science and technology, will carry through with the testing at a pilot plant at clean-energy distributor ENN Energy. “It’s the first plant in the world on such a large scale,” says principal investigator Junjie Gu, an associate professor in Mechanical and Aerospace Engineering at Carleton. “Because we are targeting the same environmental and energy problems, it’s an advantage to have China work with us. They have the experimental facility to solve the problems. And the team from Tianjin University is very good, not only because they are my friends,” Gu laughs. The “green chemistry” of SCWO has been researched for more than three decades, but the development of SCWO-based wastewater treatment technology for industrial application is still in its infancy. Challenges researchers face include salt deposits and corrosion of the equipment from the high temperatures and high pressure processes, explains co-investigator and project manager Jie (Peter) Liu, an assistant professor in Mechanical and Aerospace Engineering. Can Hydrocarbons Survive in the Hot, Pressured, Mantle? The mantle is a dense, hot layer of semisolid rock approximately 2,900 kilometers thick. The mantle, which contains more iron, magnesium and calcium than the crust, is hotter and denser because temperature and pressure inside Earth increase with depth. Because of the firestorm-like temperatures and crushing pressure in Earth’s mantle, molecules behave very differently than they do on the surface. Earth's hydrocarbons are typically formed when organic matter is trapped in sediments on the bottom of Earth's oceans, seas, lakes, swamps, and bogs. Over a period of time, exposed to varying temperatures, pressures, and anaerobic conditions, the organic matter is transformed into hydrocarbons such as natural gas, peat, coal, and oil of various types. Sediments trapped in oceanic crust (as opposed to continental crust) are subducted into the Earth's mantle after dozens of millions of years -- and exposed to very high pressures and temperatures. Many geologists had presumed that any hydrocarbons that had not migrated out of these subducted sediments, would be destroyed in the oxidising environment of the mantle. But a variety of research over the past several years suggests that not only can hydrocarbons survive the heat and pressure of the upper mantle -- new short-chain hydrocarbons may actually be created within the mantle. So far there is no strong evidence that large quantities of economically important hydrocarbons are being generated within the mantle, with subsequent migration up into the crust -- where humans can access them. But it seems quite likely that new gaseous hydrocarbons do migrate from the mantle into the crust -- in some quantities -- and contribute to gas deposits of various types, including methane clathrates. What is more interesting to me than the abiotic generation of hydrocarbons is the fate of billion year old hydrocarbons of biological origin which find their way into the upper mantle through geologic upheaval. No doubt some of this hydrocarbon will survive as medium chain alkanes, although I suspect most will end up as methane or ethane. Some will get caught up in volcanic activity and be converted to CO2 -- or get ejected into the atmosphere or ocean as CH4. But what is the proportion of each product? How much will end up in a typical oil & gas "trap" in the crust where they can be economically extracted? We will learn more about that over time. But between the abiotic gases and the truly ancient hydrocarbons that have survived the eons, it is likely that there is far more hydrocarbon in the deep Earth than geologists typically allow themselves to dream. A method of mixing a catalyst with a heavy oil to create a heavy oil/catalyst mixture. This is followed by combining the heavy oil/catalyst mixture with supercritical water to form light hydrocarbon products and heavy hydrocarbon products. By doing so the light hydrocarbon products can be separated into a gaseous top product, an upgraded liquid hydrocarbon product and a water phase. This application is a continuation-in-part of U.S. patent application Ser. No. 11/424,196, filed Jun. 14, 2006 now abandoned), which is herein incorporated by reference. Current technologies for converting heavy crudes, bitumens, etc., to lighter products include: (1) hydrocracking or (2) combinations of coking or thermal operations followed by some form of hydroprocessing. In the former, reformation of heavy crude oil into lighter hydrocarbon products is accomplished by contacting the crude oil with hydrogen and catalyst which decomposes and cracks the hydrocarbons into lighter hydrocarbons. Various designs have been utilized in the past for hydrotreatment of heavy petroleum oil. For example, in some systems, a liquid petroleum feedstock is cracked in a down-flow fixed-bed reactor. The hydrocarbon products are removed from the bottom of the reactor. This type of system is vulnerable to coking and may require frequent catalyst replacement. Other problems include flooding of the catalyst bed and plugging of the catalyst bed with metals present in the heavy oil. In addition, current crude conversion technologies are capital intensive and require a sophisticated refinery infrastructure including hydrogen plants, fuel, and feed for the production of hydrogen or a source of hydrogen. Hence, there remains a need to provide a reactor system that avoids the problems associated with fixed bed catalyst reactors. There is also a need to provide a process that provides a cheaper source of hydrogen and apparatus for simultaneous and combined thermal and catalytic treatment of extra heavy crude oil. A method of mixing a catalyst with a heavy oil to create a heavy oil/catalyst mixture. This is followed by combining the heavy oil/catalyst mixture in a slurry phase upflow reactor with supercritical water to form light hydrocarbon products and heavy hydrocarbon products. By doing so the light hydrocarbon products can be separated into a gaseous top product, an upgraded liquid hydrocarbon product and a water phase. For a more detailed description of the preferred embodiment of the present invention, reference will now be made to the accompanying drawing, which is a schematic diagram of a system constructed in accordance with the invention. FIG. 1 describes one embodiment of the method. FIG. 2, describes an alternate embodiment of the method. Referring now to the Figure one, the system 10 constructed in accordance with the present invention includes a wellhead 12, storage tank 20, slurry mixer 30, reactor 40, hot separator 50, and three-phase separator 60. Wellhead 12 receives raw crude from a well and feeds it via line 14 into storage tank 20. In some situations, the raw crude may include an amount of water and may or may not be an emulsion. While the present system does not require removal of this water before the crude/heavy oil is processed, the water can be removed using any suitable technique if removal is desired. Use of supercritical water means that hydrogenation is done through hydrogen from the water. It is theorized that use of the supercritical water eliminates the need for a hydrogen manufacturing plant (such as steam methane reformer) that would require additional machinery and cost. In storage tank 20, the crude oil, heavy oil, bitumen, deasphalted oil or resid is mixed with a catalyst that enters tank 20 via line 22. Any suitable catalyst can be used, for example the catalyst may be any suitable combination of catalysts compromising a water gas shift catalyst, cracking catalyst and a hydrogenation catalyst, such as are known in the art, may be used. In one embodiment the catalyst is a group 4 or a group 8 metal catalyst such as ZrO2 or iron based catalysts. It is preferred that the catalyst be provided as a fine powder, such as 1-100 micron, or even below 10 micron, so that slurry conditions within the reactor can be maintained. Concentration of the catalyst can be 1-10 wt % of the feed or even 1-2% of the feed. It will be understood that mixing of the crude with the catalyst could be carried out in a separate tank from storage tank 20, if desired. The mixture of catalyst and crude oil leaves tank 20 via line 24, is pressurized by a pump 25 and heated in a preheater 26, and is injected into slurry mixer 30. Supercritical water is also injected into mixer 30 via a feed line 32. The supercritical water can also contain the recycled water phase from 66 transported to the feed line via line 68. In doing so the amount of water needed in the method is decreased. Additionally, since the water coming from line 66 is already heated less energy would be required to heat the water back to a supercritical condition. Mixer 30 is preferably operated at supercritical conditions of >3000 psi and >350° C. Before entering mixer 30, the supercritical water is raised to a desired pressure and temperature by a pump 35 and heater 34. The amount of supercritical water used is dependent upon the oil. In one embodiment the water to oil ratio is between 3:1 to 1:1, preferably the water to oil ratio is 1.5:1. In yet another embodiment CO can be added to the supercritical water to provide increase oil yield. Pump 35 may be any suitable pump and heater 34 may be a resistance heater, gas-fired boiler, or any other suitable heater type. In slurry mixer 30, the hot crude/catalyst mixture from line 24 is injected into the supercritical water. The resulting crude/catalyst/water slurry is immediately injected into a reaction zone at the bottom of reactor 40. In reactor 40, heavy crude is thermally cracked at the reaction conditions and produces free radicals, which in turn extract hydrogen from the supercritical water to produce lighter hydrocarbons. Reactor 40 is preferably sized such that the reactants remain in reactor 40 for an average residence time of from about 5 to about 60 minutes, more preferably 10-20 min. If desired, part or all of the unconverted hydrocarbons from downstream in the process can be recycled into the reactor via line 58 and carbon monoxide and/or hydrogen from a downstream gasifier (described below) can also be injected into reactor 40 via line 59. If desired, additional hot (>300° C.) air may be introduced and injected into the reactor vessel through gas inlet 44. The purpose of this air is to produce hydrogen in situ via partial oxidation and shift reaction. In one embodiment, as shown in FIG. 2, it is possible to direct some of the super critical water from the heater 34 directly into the gasifier 57. By doing so it eliminates the need have a gas inlet to inject hot air/oxygen into the system. The supercritical water can contain added CO. The elimination of this step is desirable as the separation of oxygen and nitrogen in a gasifier is an expensive and energy intensive process. Therefore, steam gasification would occur in the gasifier in the presence of a suitable catalyst and the following reaction would occur. The heavy crude/catalyst/water slurry may be injected into reactor 40 via one or more nozzles in the reactor vessel. The preheating step and the supercritical water phase preferably provide sufficient heat to the incoming feed to ensure that thermal decomposition occurs. After the desired residence time in the reactor, lighter hydrocarbon products exit from the top of the reactor via line 42. Because reactor 40 is an up-flow reactor, line 42 is preferably in fluid communication with the upper half, and more preferably the upper quarter, of reactor 40. In some embodiments, (not shown) unconverted heavy residue along with solids (catalysts, metals and coke formed) may be withdrawn from the bottom of the reactor. There are five main reactions that are occurring in reactor 40. Reaction products, including gaseous and liquid hydrocarbons and supercritical water are removed from the top of reactor 40 via line 42 and enter hot separator 50. Hot separator 50 is preferably operated at sub-critical conditions at lower pressure and temperature such that water losses its supercritical properties and lighter liquid products including the gaseous hydrocarbons, other gaseous and water are removed from the top of separator 50 via line 52, while heavier hydrocarbons precipitates out including unconverted resid/pitch, which may contain metals, catalysts and/or coke, is removed from the bottom of hot separator 50 via line 54. All or a portion of the unconverted resid/pitch heavy products from line 54 can be recycled directly to reactor 40 via line 58 in order to increase the yield of lighter products. Alternatively, if desired, some or all of the materials in line 54 can be passed through an optional vacuum flash unit 55 and separated into more volatile hydrocarbons and less volatile hydrocarbons. If desired, the more volatile hydrocarbons can be added to liquid hydrocarbon product in line 64 via line 67. Alternatively, or in addition, a portion of the heavy products from line 54 can be subjected to gasification and/or catalytic oxidation and/or catalytic steam gasification, through line 56 in an optional gasifier 57 so as to produce syngas (CO+H2). Gasifier 57 can be a plasma gasifier, or other suitable device. The resulting gas or syngas can be injected into reactor 40 via line 59 in order to increase hydrogenation therein. If desired, additional hydrogen can be produced inside the reactor through shift reaction with the production of CO through partial oxidation by injecting air into the heavy crude/catalyst/water slurry via line 44 into reactor 40. If CO or syngas is added to reactor 40, it is preferred to use as the catalyst a compound comprising zirconium oxide (10-80%) and iron oxide. The iron oxide may be present as a catalyst support. Alternatively, the catalyst may be any suitable combination of catalysts compromising a water gas shift catalyst and a hydrogenation catalyst. The products leaving the top of hot separator 50 via line 52 preferably enter three-phase separator 60, which further separates the stream into three fractions. In certain embodiments, the fractions may comprise a gaseous top product, which exits via line 62, a liquid hydrocarbon product, which exits via middle line 64, and a water phase, which exits via bottom line 66. The upgraded liquid product in line 64 is the most desirable salable product that is known as “synthetic crude oil” and can be pipelined to a refinery for further treatment to produce gasoline diesel jet fuel or transportation fuel. If desired, the water in line 66 may be cleaned and recycled to the supercritical system via line 68. A cleaning unit (not shown) such as are known in the art may be included in line 68. If desired, the gaseous top product phase in line 62, which usually consists of C1-C4 hydrocarbons, CO2 and H2S, may be cleaned in an acid gas treatment plant 69, and recycled to the gasifier 57 through line 63, in order to generate additional syngas for the reactor 40. The catalyst added to the crude preferably comprises a mixture of two or more inorganic metal compounds, such as zirconia and iron oxide. The catalyst is preferably provided as particles or as a fine powder (10-100 micron) and may comprise two or more metals selected from the group consisting of: ZrO2, Fe2O3, K2O3, NaCO3, other metal oxides such as Ni/Co, metal carbonates, and combinations thereof. In operation, the slurry containing catalyst and heavy crude is heated to about 100 to 500° C. (200 to 930° F.) before being injected into the supercritical water. Likewise, the water is heated to supercritical conditions, preferably a temperature greater than 300° C., more preferably greater than 370° C. (700° F.), and a pressure greater than 22 MPa (3200 psi). Temperature and pressure within reactor 40 are preferably maintained between 400 and 500° C. (752 and 932° F.) and between about 20.7 and 34.5 MPa (3000 and 5000 psig). In hot separator 50 downstream of reactor 40, temperature and pressure are preferably maintained between 300 and 400° C. (572 and 752° F.) and between about 13.8 and 20.7 MPa (2000 and 3000 psig). The batch unit consists of a high-pressure 500 mL reactor, which is further connected to a high-pressure vessel (separator) to collect distillate product and water. Because of high pressure operation, the whole set-up was placed inside a high-pressure cell and operated from out side the cell. All other necessary safety requirements were met. The outlet of the separator was connected to a vent line through H2S scrubber. The reactor was usually charged with about 50 g of Athabasca Bitumen crude and about 50 g water. In a few cases water to crude ratio was varied from 0.5 to 1.5 by weight. In most of the cases a mixture of Zirconium oxide (ZrO2) (about 10% of crude) and promoter potassium carbonate (about 1% of ZrO2) was used as catalyst. The reactor was first pressure tested to 3500 psi with N2 then depressurized. Whenever required, about 100-120 psi (cold) CO or hydrogen was added to the system. For steam only cases the reactor was pressurized with N2. At reaction conditions partial pressure of added gas was about 8 to 10% of the total pressure. The reactor was heated to required temperature (in most cases 800° F.) and hold for certain time (most cases 30 min). The final pressure reached between 2800 to 3200 psi, except when water to crude ratio was 0.5, the pressure was below 2000 psi. Then the reactor was cooled to around 650° F. and pressure was released to the separator where distillate and steam were collected along with gaseous products. Separator was cooled and gas was released to vent line. In a few cases gas samples were collected for analysis. The distillate product was separated from the water easily in a separating funnel and weighed (W2). The reactor content was weighed (W3) and then filtered and washed with toluene under vacuum to remove the catalyst and coke formed. Difference between the weights of dry solid (W4) and catalyst reported here as coke yield. Difference between the weights of total reactor content and the dry weight of the solid (W5=W3-W4) gave the amount of resid in the reactor. Total liquid yield reported here as the sum of the amount of distillated recovered in the separator and the weight of the solid free residue (W2+W5). This application claims priority to Canadian Patent Application 2,757,962 filed November 8, 201 1 entitled, PROCESSING A HYDROCARBON STREAM USING SUPERCRITICAL WATER; the entirety of which is incorporated by reference herein. The present disclosure relates generally to processing a hydrocarbon stream, for instance a bituminous stream from the extraction of mined oil sands, or from an in situ recovery process. Much of the world's oil is found in the form of oil sands, large deposits of which are found in Alberta, Canada. The bitumen in oil sands cannot typically be pumped from the ground in its natural form because of its high viscosity. Oil sand deposits near the surface may be recovered by open-pit mining techniques, using powered shovels to remove the oil sand and load the trucks for transport to an extraction plant. Because the bitumen itself is a highly viscous material, separating it from the sands poses certain practical difficulties. The extraction of bitumen from oil sands mined in such a manner involves the liberation and separation of bitumen from the associated sands in a form that is suitable for further processing to produce a marketable product. Among several processes for bitumen extraction, the Clark Hot Water Extraction (CHWE) process represents a well-developed commercial recovery technique. In the CHWE process, mined oil sands are mixed with hot water to create a slurry suitable for extraction. Caustic is added to adjust the slurry pH to a desired level and thereby enhance the efficiency of the separation of bitumen. Recent industry developments have shown the feasibility of operating at lower temperatures and without caustic addition in the slurrying process. The result of most of the CHWE processes is an extract that typically comprises two parts: a hydrocarbon predominant phase (known as a bitumen froth stream), and a tailings stream made up of coarse solids, some fine solids, and water. The specific properties of the tailings will vary depending on the extraction method used, but the tailings essentially comprise spent water, reagents (e.g. surfactants), and waste ore once the recovered bitumen has been removed. A typical composition of the bitumen froth stream is about 60 wt% bitumen, 30 wt% water and 10 wt% mineral matter (solids), with some variations to account for the extraction and processing conditions. The water and mineral matter in the froth are considered as contaminants and must be either essentially eliminated or reduced to a level suitable for pipeline transportation, feed to an oil refinery or an upgrading facility. The processes to reject the water and mineral matter contaminants are known as froth treatment processes. Due to the high viscosity of bitumen, the first step in such processes is usually the introduction of a solvent. There are two major commercial approaches to reject the froth contaminants, namely naphtha solvent-based froth treatment and paraffinic solvent-based froth treatment. Solvent addition (dilution) increases the density differential between bitumen and water and mineral matter and enables contaminants rejection, which can be carried out by any number of methods, such as centrifugation or gravity separation using multi-stage gravity settling units. The separation schemes generally result in a product effluent stream of diluted bitumen ("d i I b it" ) and a reject or tailings stream, commonly referred to as the froth treatment tailings, comprising mineral matter, water, residual solvent, and some residual bitumen. More specifically, in a paraffinic froth treatment process the solvent dilution induces the precipitation of asphaltenes from the bitumen as an additional contaminant that results in an improvement in the efficiency of the contaminant rejection process. An example of naphtha froth treatment (NFT) is disclosed in U.S. Patent No. 5,236,577. Addition of naphtha and separation may yield a bitumen product containing 1 to 3 wt% water and < 1.0 wt% solids. Such product composition does not meet pipeline specifications and renders the NFT product stream unsuitable for transportation through a common pipeline carrier. Examples of paraffinic froth treatment (PFT) are described in Canadian Patents Nos. 2,149,737 and 2,217,300. The addition of sufficient amounts of paraffinic solvent results in asphaltene precipitation, formation of aggregates with the contaminants (entrained water and carryover solids in the froth), and settling. Conventional treaters which separate water and mineral matter will not remove very fine particulate ("fines") from the froth. Therefore, PFT settling vessels are sized to allow gravity settling of fines and other contaminants to provide a solids-free dry bitumen product (< 300 wppm solids, < 0.5% BS&W) suitable for transportation in a common carrier to refineries. Bitumen of such quality is termed "fungible" because it can be processed in conventional refinery processes, such as hydroprocessing, without dramatically fouling the refinery equipment. However, PFT is energy-intensive and expensive and results in a waste stream of asphaltenes - a potentially valuable commodity. The CHWE process, described above, is the most commonly employed water- based extraction process. In the case of water-based extraction, water is the dominant liquid in the process and the extraction occurs by having water displace the bitumen on the surface of the solids. Solvent-based extraction processes for the recovery of the hydrocarbons have been proposed as an alternative to water-based extraction of mined oil sands. In the case of solvent-based extraction, the solvent is the dominant liquid and the extraction of the bitumen occurs by dissolving bitumen into the solvent. However, the commercial application of a solvent-based extraction process has, for various reasons, eluded the oil sands industry. A major challenge to the application of solvent-based extraction to oil sands is the tendency of fine particles within the oil sands to hamper the separation of solids from the hydrocarbon extract. Solvent extraction with solids agglomeration is a technique that has been proposed to deal with this challenge. The original application of this technology was coined Solvent Extraction Spherical Agglomeration (SESA). A more recent description of the SESA process can be found in Sparks et al., Fuel 1992(71 ); pp 1349-1353. Previously described methodologies for SESA have not been commercially adopted. In general, the SESA process involves mixing oil sands with a hydrocarbon solvent, adding a bridging liquid to the oil sands slurry, agitating the mixture in a slow and controlled manner to nucleate particles, and continuing such agitation to permit these nucleated particles to form larger multi-particle spherical agglomerates for removal. The bridging liquid is preferably water or an aqueous solution since the solids of oil sands are mostly hydrophilic and water is immiscible with hydrocarbon solvents. The SESA process described by Meadus et al. in U.S. Patent No. 4,057,486, involves combining solvent extraction with solids agglomeration to achieve dry tailings suitable for direct mine refill. In the process, organic material is separated from oil sands by mixing the oil sands material with an organic solvent to form a slurry, after which an aqueous bridging liquid is added in the amount of 8 to 50 wt% of the feed mixture. By using controlled agitation, solid particles from oil sands come into contact with the aqueous bridging liquid and adhere to each other to form macro-agglomerates of a mean diameter of 2 mm or greater. The formed agglomerates are more easily separated from the organic extract compared to un-agglomerated solids. This process permitted a significant decrease in water use, as compared with conventional water-based extraction processes. Furthermore, the organic extract produced has significantly lower amounts of solids entrained within compared to previously described solvent-based extraction methods. Solvent extracted bitumen has a much lower solids and water content than that of bitumen froth produced in the water-based extraction process. However, the residual amounts of water and solids contained in solvent extracted bitumen may nevertheless render the bitumen unsuitable for marketing. Removing contaminants from solvent extracted bitumen is difficult using conventional separation methods such as gravity settling, centrifugation or filtering. Another example of a solvent-based extraction process is described in Canadian Patent Application Serial No. 2,724,806 ("Adeyinka et al. "), filed December 10, 2010 and entitled "Processes and Systems for Solvent Extraction of Bitumen from Oil Sands". Solvent deasphalting has previously been proposed for product cleaning of solvent extracted bitumen. Deasphalting technologies are described in U.S. Patent No. 4,572,777 (Peck), issued February 25, 1986 entitled: Recovery of a carbonaceous liquid with a low fines content; and U.S. Patent No. 4,888,108 (Farnand), issued December 19, 1989 entitled: Separation of Fines Solids from Petroleum Oils and the Like. The solvent deasphalting processes described in these patents do not indicate the formation of a fungible product in a deasphalting step. The processes described in these patents are limited by the type of deasphalting solvent used and the proper deasphalting solvent to bitumen ratio required for optimal solids removal. The deasphalting process described were not specific and relied more on conventional deasphalting technologies, such as those commonly used in refineries to produce heavy crude, oils to upgrade heavy bottoms streams, and/or to deasphalt oil. However, these conventional deasphalting technologies operate at high temperatures and pressures, and at a low feed rate, compared to what would be required for a large scale production facility. These deasphalting technologies are expected to be even more energy-intensive and expensive than the PFT process. Furthermore, like PFT, a portion of the potentially valuable asphaltenes are removed from the bitumen product. Where deposits lie well below the surface, bitumen may be extracted using in situ ("in place") techniques. One example of an in situ technique is the steam-assisted gravity drainage method (SAGD). In SAGD, directional drilling is employed to place two horizontal wells in the oil sands - a lower well and an upper well positioned above it. Steam is injected into the upper well to heat the bitumen and lower its viscosity. The bitumen and condensed steam will then drain downward through the reservoir under the action of gravity and flow into the lower production well, whereby these liquids can be pumped to the surface. At the surface of the well, the condensed steam and bitumen are separated, and the bitumen is diluted with appropriate light hydrocarbons for transport to a refinery or an upgrader. An example of SAGD is described in U.S. Patent No. 4,344,485 (Butler). In other processes, such as in Cyclic Steam Stimulation (CSS), the same well is used both for injecting a fluid and for producing oil. In CSS, cycles of steam injection, soak, and oil production are employed. Once the production rate falls to a given level, the well is put through another cycle of injection, soak, and production. An example of CSS is described in U.S. Patent No. 4,280,559 (Best). Steam Flood (SF) involves injecting steam into the formation through an injection well. Steam moves through the formation, mobilizing oil as it flows toward the production well. Mobilized oil is swept to the production well by the steam drive. An example of steam flooding is described in U.S. Patent No. 3,705,625 (Whitten). Other thermal processes include Solvent-Assisted Steam Assisted Gravity Drainage (SA-SAGD), an example of which described in Canadian Patent No. 1 ,246,993 (Vogel); Vapour Extraction (VAPEX), an example of which is described in U.S. Patent No. 5,899,274 (Frauenfeld); Liquid Addition to Steam for Enhanced Recovery (LASER), an example of which is described in U.S. Patent No. 6,708,759 (Leaute et al. ); and Combined Steam and Vapour Extraction Process (SAVEX), an example of which is described in U.S. Patent No. 6,662,872 (Gutek), and derivatives thereof. Presently, heavy oil and bitumen are upgraded by either thermal conversion processes which reject carbon typically as coke (delayed coking or fluid coking) or by hydroconversion/hydrocracking processes in which hydrogen is added to the heavy oil to improve properties and reject contaminants such as metals and sulfur. Although thermal conversion processes such as coking are widely practiced throughout the world and in the Athabasca region of Alberta, Canada, these processes are typically capital and operating cost intensive. Moreover, they require secondary hydrotreating to improve the quality of the coker liquids and they reject up to 25 wt % of the feed as solid coke waste which has little or no value. The present disclosure relates to a process for upgrading a bitumen stream by heating the stream to near-critical or super-critical conditions of water in the stream. The bitumen stream may be from a water-based extraction process, an in situ bitumen recovery process, or a solvent-based bitumen extraction process. To achieve an appropriate feed stream composition, water and/or clay may be added. The clay offers a catalytic effect. To achieve an appropriate feed stream composition, water may alternatively be removed. In one aspect, there is provided a process for upgrading a bitumen production stream, the process comprising: providing a bitumen production stream; adding clay and/or adding or removing water, where required, to achieve a water content of 10 to 40 wt % and a clay content of 5 to 15 wt % to produce a feed stream; and heating the feed stream to near- critical or super-critical conditions of the water to produce an upgraded bitumen stream. Fig. 1 is a flow chart illustrating a process according to a disclosed embodiment. Fig. 2 is a graph illustrating boiling point distributions for three different bitumen streams. Fig. 3 is a schematic of a process according to a disclosed embodiment. As used herein, the term "bitumen stream" refers to a stream derived from oil sands that requires downstream processing in order to realize valuable bitumen products or fractions. The bitumen stream is one that comprises bitumen along with undesirable components. The bitumen stream may be a stream that has already realized some initial processing but nevertheless requires further processing. The bitumen stream need not be derived directly from oil sands, but may arise from other processes. For example, a waste product from other extraction processes which comprises bitumen that would otherwise not have been recovered, may be used as the bitumen stream. Such a bitumen stream may be also derived directly from oil shale oil, bearing diatomite or oil saturated sandstones. Examples of bitumen streams are bitumen streams from a water-based extraction process, an in situ bitumen recovery process, or a solvent-based bitumen extraction process. Generally, embodiments of the present disclosure relate to a process for upgrading a bitumen stream by heating the stream to near-critical or super-critical conditions of the water in the stream. The bitumen stream may be a bitumen stream from a water- based extraction process, from an in situ bitumen recovery process, or from a solvent-based bitumen extraction process. Certain bitumen streams will already include suitable amounts of water and clay. The clay offers a catalytic effect. Where a bitumen stream does not already have an appropriate level of clay, clay may be added. Where a bitumen stream does not already have an appropriate level of water, water may be added or removed. Figure 1 illustrates one embodiment where the process for upgrading a bitumen production stream comprises providing a bitumen production stream 102; adding clay and/or adding or removing water, where required, to achieve a water content of 10 to 40 wt % and a clay content of 5 to15 wt % to produce a feed stream 104; and heating the feed stream to near-critical or super-critical conditions of the water to produce an upgraded bitumen stream 106. The application of supercritical water (SCW) as a solvent, a reaction moderator, or even a possible hydrogen donor during the upgrading of bitumen has received attention. In fact, the use of water as a solvent at high temperature and pressure has been suggested to offer potential for controlling reaction pathways during bitumen upgrading. In preliminary experiments, it was demonstrated that the addition of water, under super or near-critical conditions, to bitumen in a continuous flow apparatus resulted in a significant modification of bitumen properties, namely residue conversion (as illustrated in Figure 2 by boiling point distribution), viscosity, and Micro Carbon Residue (MCR). As illustrated in Figure 2, the SCW bitumen product has undergone heavy end conversion leaving lighter products which boil off at lower temperatures as compared to both Athabasca bitumen and PFT. In SCW bitumen upgrading processes, bitumen and water are heated separately to their desired temperatures and subsequently mixed, and reacted for short durations, i.e., seconds. Hydrolysis of water is theorized by one patent document where short contact time allows hydrogen radicals to react with the hydrocarbon, preventing some of the radicals from recombining to water. Figure 3 illustrates one embodiment using bitumen froth as the feed stream. Bitumen froth 302 is added to a SCW upgrading vessel 304. The SCW upgrading vessel may be a thick-walled vessel, with or without internal baffles and/or a mixing device, suitably designed for the temperature and pressure conditions appropriate for near-critical or supercritical conditions of water. The bitumen froth is heated to near or above the critical point of water (374 °C, 21.8 MPa) and reacted for a desired residence time, for instance 1 to 60 minutes, 1 to 10 minutes, 1 to 5 minutes, or 1 to 2 minutes. The clays present in the froth provide some catalytic activity to enhance the reaction process. The clays also act as a substance upon which some heavy metals can deposit. The heavy metals may include vanadium and nickel. Upon completion of the reaction, the upgraded bitumen and the water and solids (together 306) are sent to bitumen recovery 308 to remove residual water/solids and to recover the upgraded hydrocarbons. As a result of the SCW upgrading, the separation of the hydrocarbons from the water and solids is facilitated due to an increased specific gravity differential between the upgraded bitumen and the water and significant drop in bitumen viscosity. The upgraded bitumen 310 may be sent to a pipeline. The water and solids (together tailings 312) may be sent for tailings treatment. Heat may be recovered from the tailings. Other potential advantages of certain embodiments may include the following. Water present in the process may serve to sequester gases (such as H2S, S02, C02) produced during the process due to the inherent alkalinity of the water in the feed stream. Also, solids present in the feed stream may provide some catalytic activity toward carbon- carbon bond cleavage. Bitumen froth may comprises about 60 wt % bitumen, 30 wt % water, and 10 wt % solids. The solids may be mostly clay. Of course, depending on the oil sands and the particular process used to obtain the froth, this composition may vary. Certain bitumen streams may not possess the appropriate amounts of water and/or clay for this process. An appropriate water content is 10 to 40 wt %, or 20 to 30 wt % Too much water may necessitate a very large vessel, which may not be commercially desirable. Too little water will not provide an adequate solvency effect. Therefore, water may be added or removed to achieve appropriate compositions for this process. An appropriate clay content is 5 to 15 wt %. Therefore, clay may be added, if required. While clay could be removed, this may not be commercially efficient. For instance, bitumen production stream from SAGD or CSS may require dewatering and clay addition. On the other hand, a bitumen stream from a solvent-based extraction process may require the addition or both water and clay. By using embodiments of the present process, bitumen extraction and upgrading may be integrated, with the possibility of eliminating froth treatment and generating a product that meets fungible product specifications for pipeline transportation, i.e. API, viscosity, and Basic Sediment & Water (BS&W) specifications. In the preceding description, for purposes of explanation, numerous details are set forth in order to provide a thorough understanding of the embodiments. However, it will be apparent to one skilled in the art that these specific details are not required. A brief survey of the literature concerning volcanogenic carbon dioxide emission finds that estimates of subaerial emission totals fail to account for the diversity of volcanic emissions and are unprepared for individual outliers that dominate known volcanic emissions. Deepening the apparent mystery of total volcanogenic CO2 emission, there is no magic fingerprint with which to identify industrially produced CO2 as there is insufficient data to distinguish the effects of volcanic CO2 from fossil fuel CO2 in the atmosphere. Molar ratios of O2 consumed to CO2 produced are, moreover, of little use due to the abundance of processes (eg. weathering, corrosion, etc) other than volcanic CO2emission and fossil fuel consumption that are, to date, unquantified. Furthermore, the discovery of a surprising number of submarine volcanoes highlights the underestimation of global volcanism and provides a loose basis for an estimate that may partly explain ocean acidification and rising atmospheric carbon dioxide levels observed last century, as well as shedding much needed light on intensified polar spring melts. Based on this brief literature survey, we may conclude that volcanic CO2 emissions are much higher than previously estimated, and as volcanic CO2 contributions are effectively indistinguishable from industrial CO2 contributions, we cannot glibly assume that the increase of atmospheric CO2 is exclusively anthropogenic. Aside from the fact that isotopic analysis is not chemical analysis, I would go so far as to suggest that the same basin sediment kerogen (the carbon source for oil) in addition, no doubt, to some petroleum reservoirs have been subducted and are a major source for volcanic CO2 emissions at continental margins. Due to the fact that the subduction zone is where crustal material enters the mantle, subducted carbon reservoirs would represent the youngest magmatic source of CO2. Given the confirmed presence of carbon and particularly CO2enriched fluids in magma and lava (Wilson, 1989), one may well ask if it would not be so irrational to suppose that volcanogenic carbon released at continental margins (closest to the subduction zone) is very old; far too old in fact to contain any measurable amount of 14C. Moreover, mantle carbon and CO2 is vastly older still, as only longer lived cosmogenic isotopes such as 10Be can be used to confirm the speed of mantle convection. In fact, Clark & Fritz (1997) document that there is no volcanic emission of 14C. The misuse of the Suess Effect as a fossil fuel fingerprint instead of an empirical standard for the correction of carbon dating contamination, lead to an initially idiosyncratic expansion of this concept by Keeling (1979), who sought to include 13C depletion of vegetation and its effect on the atmosphere. The atmosphere is enriched in 13CO2 by the process of photosynthesis, which favours the assimilation of 12C into plant tissue during growth (Furquhar et al., 1989). This is used to differentiate between terrestrial and oceanic CO2sources (Keeling et al., 2005), and the concept, proposed by Craig (1954), is actually older than Suess' original research. Moreover, plant based fossil fuel derivatives are therefore considered to be 13C depleted. Following this line of logic, fossil fuel emissions, being derived from plants, should be 13CO2 depleted as well. However, when the Keeling (1979) article expanded its internal definition of the Suess Effect to include this observation, it was once again to the exclusion of volcanic influence. In point of fact, magmatic carbon is, for the most part, 13C depleted. This is solidly confirmed by numerous studies of deep mantle rocks (Deines et al., 1987; Pineau & Mathez, 1990; Cartigny et al., 1997; Zheng et al., 1998; Puustinen & Karhu, 1999; Ishikawa & Marayuma, 2001; Schultz et al., 2004; Cartigny et al., 2009; Statchel & Harris, 2009) as well as mid-oceanic ridge outgassing (De Marais & Moore, 1984). Moreover, 13C depletion of volcanic emissions is so well known that Korte and Kozur (2010) explore volcanism, amongst other possible causes, in search of an explanation for atmospheric depletion of 13C across the Permian-Triassic boundary. Although many significant carbonates are not 13C depleted, they are eventually subducted along with organic carbon sources depleted in 13C. Nevertheless, the emissions of continental margin and back arc volcanoes that source a significant proportion of their carbon from subducted volatiles, remain 13C depleted (eg. Giggenbach et al., 1991; Sano et al., 1995; Hernández et al., 2001). Thus, as plants continue to enrich the atmosphere in 13C while supplying the 13C depleted kerogen that is subducted into the mantle, volatiles failing to return to the surface may cause the mantle to become increasingly 13C depleted over time. Moreover, the significant proportion of volcanic carbon dioxide that diffuses through the soil (Gerlach, 1991) has its carbon isotope chemistry further contaminated by 13 depleted biogenic soil carbon (Hernández et al., 2001). Both tectonic and volcanic CO2 are magmatic and depleted in both 13C & 14C. In the absence of statistically significant isotope determinations for each volcanic province contributing to the atmosphere, this makes CO2 contributions of volcanic origin isotopically indistinguishable from those of fossil fuel consumption. It is therefore unsurprising to find that Segalstad (1998) points out that 96% of atmospheric CO2 is isotopically indistinguishable from volcanic degassing. So much for the Royal Society's unexplained "chemical analysis". If you believe that we know enough about volcanic gas compositions to distinguish them chemically from fossil fuel combustion, you have indeed been mislead. As we shall see, the number of active volcanoes is unknown, never mind a tally of gas signatures belonging to every active volcano. We have barely scratched the surface and as such, there is no magic fingerprint that can distinguish between anthropogenic and volcanogenic sources of CO2. Weathering and the successive oxidation of elements like iron from minerals such as pyroxenes present a major example of how oxygen is consumed without producing carbon dioxide, because carbon is not the only element on the planet that preferentially combines with oxygen. Such reactions drive the number of mol of O2 consumed per mol of CO2 produced higher. As you can see, it is not only fossil fuels that drive this ratio in this direction, and it is a simpler matter to more comprehensively measure volcanic CO2 output to determine whether volcanoes are indeed a significant CO2 contributor. Until reading Hillier & Watts (2007), I would have estimated that the oceans, occupying twice the surface area of land, would have twice the number of volcanoes. In fact the number of submarine volcanoes is very much higher than twice the number of subaerial volcanoes. Given the update of Werner & Brantley (2003), which raises the estimate of subaerial volcanogenic CO2 from 27±3 MtCpa to 78±6 MtCpa, this would seem to imply roughly 200 MtCpa from submarine volcanogenic CO2 and brings the total estimate of volcanic CO2 in line with the bare minimum determined by Morner & Etiope (2002). Plimer (2001; 2009) & Wishart (2009) maintain that the amount of CO2 from volcanoes is enormous, and without estimating an amount suggests that it dwarfs anthropogenic contributions. If we take the updated estimate, correct the conservative bias, and extend to submarine environments we still wind up with a figure around 1.5 GtCpa for total passive volcanic emissions (excluding imponderables such as mid oceanic ridge emissions) and that is still only 20% of the 7.8 GtCpa attributed to anthropogenic CO2 emissions by the IPCC. As it turns out, there is a lot more to the distribution of volcanoes across different tectonic settings, and Plimer (2009) omits the rather small detail of a 2007 paper presenting primary evidence that underpins his claim in spectacular fashion. Hillier & Watts (2007) surveyed 201,055 submarine volcanoes estimating that a total of 3,477,403 submarine volcanoes exist worldwide. According to the observations of Batiza (1982), we may infer that at least 4% of seamounts are active volcanoes. We can expect a higher percentage in the case of the count taken by Hillier & Watts (2007) because it includes smaller, younger seamounts; a higher proportion of which will be active. Nevertheless, in the spirit of caution and based on our minimum inference of 4% seamount activity from Batiza's observations, I estimate 139,096 active submarine volcanoes worldwide. If we are to assume, in the absence of other emission figures for mid oceanic plate volcanoes, that Kilauea is a typical mid oceanic plate volcano with a typical mid oceanic emission of 870 KtCpa (Kerrick, 2001), then we might estimate a total submarine volcanogenic CO2 output of 121 GtCpa. Even if we assume, as Kerrick (2001) and Gerlach (1991) did, that we've only noticed the most significant outgassing and curb our estimate accordingly, we still have 24.2 GtCpa of submarine volcanic origin. If guesses of this order are anywhere near the ballpark, then we can take it that either what has been absorbing all this extra CO2 is not absorbing as much or there has been some variation to volcanic output over the past 500 years or so. Both are normal assumptions given the variable state of the natural environment, and considering that vegetation consumed something on the order of 38GtCpa more in 1850 than today (see my Deforestation article for the quick and dirty calculation), it is hardly surprising that we were missing a large natural CO2source in the carbon budget. The other possibility is that both Werner et al (2000: approx. 38 KtCpa) and Werner & Brantley (2003: approx. 4000 KtCpa) are correct, which could imply that volcanogenic CO2 emissions are increasing. This certainly would explain steadily rising CO2observed at stations in regions most affected by volcanic emissions, it could partly explain the recent increase in ocean acidification discussed by Archer (2009, pp. 114-124), and further it would explain the more intense Spring melting centred on the Pacific Coast of Antarctica and along the Gakkel Ridge under the Arctic ice cap. 6.0 Conclusion: Three Million Volcanoes "Can't be Wrong"
The second most erupted gas on the planet next to steam has a significant magmatic source in which it is preferentially fractionated towards the surface. On the scale of atmospheric composition, the isotopic composition of volcanogenic CO2 is effectively indistinguishable from fossil fuel CO2 due to the complete lack of statistically significant carbon isotope determinations for each of the contributing volcanic and tectonic provinces. Moreover, molar oxidation estimates cannot be used to constrain volcanogenic CO2 output because such estimates neglect the fact that carbon is not the only abundant element on the planet that preferentially combines with oxygen. It is only through emission monitoring taken in statistically significant empirical samples for each volcanic province that we may calculate a scientific estimate of total worldwide volcanic CO2 emission and perhaps, with statistically significant carbon isotope data for each volcanic province, we may one day be able to distinguish volcanic and industrial CO2 contributions in the atmosphere. Eruptions and volcanic geochemistry are highly variable and so too are volcanic emissions. The lack of any sizeable volcanic eruptions (on the scale of Krakatoa, Tambora, Laki, Huaynaputina, Kuwae, Eldja, etc.) in the 20th Century confirms the volcanic quiescence of this time. Perhaps the reduction of frequency and amount of SO2 ejected into the stratosphere may explain the slight upward trend of atmospheric temperature last century. Perhaps the simplest explanation for the last century's volcanic quiescence is a greater and more consistent release of volcanic gases in passive emissions whose sub-surface accumulation would have otherwise resulted in the buildup of pressure in magma chambers, and consequently much more violent eruptions. Irrespective that some authors may neglect to allow for significant volcanogenic CO2 input to the atmosphere, volcanoes represent an enormous CO2 source that is mostly submarine. Furthermore, volcanic activity beneath both ice caps and localized to the regions of most intense melting has demonstrated an obvious cause of stronger Spring melts at the Poles. It is evident from the observations of Sohn et al. (2008) & Reves-Sohn et al. (2008) that the Northwest Passage was opened up by powerful volcanic activity under the Arctic Ice along the Gakkel Ridge, while West Antarctic melting (as opposed to thickening of ice throughout the rest of Antarctica) can be explained by recent volcanic activity beneath the ice (Corr & Vaughan, 2008). Moreover, there are simply too many volcanoes to deny that the atmospheric concentration of the most erupted gas next to water is predominantly controlled by the balance or lack thereof between volcanic activity and photosynthesis. Furthermore, there is simply no established volcanic CO2 fingerprint by which we may distinguish atmospheric proportions of anthropogenic and volcanogenic contributions. This leaves us with no empirical method by which we may attribute the 20th century rise in CO2 to human energy consumption. Natural resources are like catnip for power- and cash-hungry governments, which is why a number of countries have battled over the North Pole for decades. Beneath the frozen tundra bordered by Canada, Denmark, Norway, Russia and the United States lies some 30 percent of the world’s undiscovered natural gas, and 15 percent of its untapped oil. And each of those countries is hell-bent on getting the biggest slice of the pie. Perhaps the most hotly contested area is the Lomonosov Ridge, which spans 1,800 miles and divides the Amerasian and Eurasian basins. Both Canada and Russia claim that resource-rich ridge is a natural extension of their continental shelves. Russia’s 2001 claim to the Ridge was rejected by the United Nations (the governing body that decides such matters), but that didn’t stop the country from planting its flag on the North Pole in 2007. It is the Canucks, however, who have made the most recent play for the North Pole. In December, Canada filed an application with the U.N. arguing that the North Pole falls within Canadian territory, and this month it launched two ice-breaking ships with the mission of gathering scientific data to support its claim. The Canadian government has reportedly spent nearly $200 million in such expeditions as part of its quest for Arctic sovereignty. All this makes you wonder: Just how much is the North Pole actually worth? Well, we did the math. The best estimate of what lies under the North Pole comes from a 2008 study of the Arctic conducted by a team of scientists from the U.S. Geological Survey. The agency believes that there are about 90 billion barrels of oil and 1,669 trillion cubic feet of natural gas in the Arctic. Multiply those quantities by the 52-week price highs for the commodities ($105.55 per barrel for oil and $4.87 per million BTU for natural gas), and the Arctic reserves of oil and gas could be worth a whopping $9.1 trillion and $8.1 trillion, respectively. Add those figures up, and the northern expanse could be worth $17.2 trillion in crude oil and natural gas alone… and that’s not even counting other resources which be hiding under those subterranean seabeds—think uranium, for example). That’s bigger than the entire U.S. economy. That’s a lot of green buried under all that white snow and ice. Which means this international battle over the upper Arctic is only going to—pardon the pun, climate warming denialists—heat up. But how does the U.N. actually decide which countries own what? Well, It is complicated—which is what makes the ownership of the Arctic such a contentious international issue. The Convention of the Law of the Sea, also known as the constitution of the oceans, says that all countries are entitled to a continental shelf of up to 200 nautical miles and in turn rights over the natural resources of the seabeds extending from their continental shelves. This is why Canada, Russia and the rest are all scrambling to gather scientific data that proves the North Pole extends from the continental shelves over which they have sovereignty. Basically, they need to map the ocean floor and hope the data comes out in their favor. In the typical textbook picture, volcanoes, such as those that are forming the Hawaiian islands, erupt when magma gushes out as narrow jets from deep inside Earth. But that picture is wrong, according to a new study from researchers who conclude that seismology data are now confirming that such narrow jets don't actually exist. "Mantle plumes have never had a sound physical or logical basis," Anderson says. "They are akin to Rudyard Kipling's 'Just So Stories' about how giraffes got their long necks." According to current mantle-plume theory, Anderson explains, heat from Earth's core somehow generates narrow jets of hot magma that gush through the mantle and to the surface. The jets act as pipes that transfer heat from the core, and how exactly they're created isn't clear, he says. But they have been assumed to exist, originating near where Earth's core meets the mantle, almost 3,000 kilometers underground -- nearly halfway to the planet's center. The jets are theorized to be no more than about 300 kilometers wide, and when they reach the surface, they produce hot spots. While the top of the mantle is a sort of fluid sludge, the uppermost layer is rigid rock, broken up into plates that float on the magma-bearing layers. Magma from the mantle beneath the plates bursts through the plate to create volcanoes. As the plates drift across the hot spots, a chain of volcanoes forms -- such as the island chains of Hawaii and Samoa. "Much of solid-Earth science for the past 20 years -- and large amounts of money -- have been spent looking for elusive narrow mantle plumes that wind their way upward through the mantle," Anderson says. To look for the hypothetical plumes, researchers analyze global seismic activity. Everything from big quakes to tiny tremors sends seismic waves echoing through Earth's interior. The type of material that the waves pass through influences the properties of those waves, such as their speeds. By measuring those waves using hundreds of seismic stations installed on the surface, near places such as Hawaii, Iceland, and Yellowstone National Park, researchers can deduce whether there are narrow mantle plumes or whether volcanoes are simply created from magma that's absorbed in the sponge-like shallower mantle. "This is a simple demonstration that volcanoes are the result of normal broad-scale convection and plate tectonics," Anderson says. He calls this theory "top-down tectonics," based on Kelvin's initial principles of mantle convection. In this picture, the engine behind Earth's interior processes is not heat from the core but cooling at the planet's surface. This cooling and plate tectonics drives mantle convection, the cooling of the core, and Earth's magnetic field. Volcanoes and cracks in the plate are simply side effects. The results also have an important consequence for rock compositions -- notably the ratios of certain isotopes, Natland says. 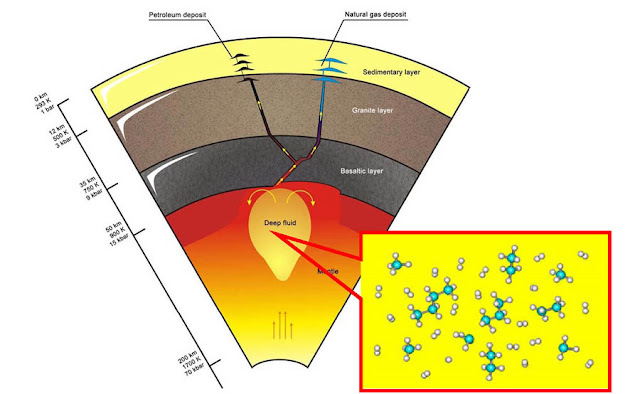 According to the mantle-plume idea, the measured compositions derive from the mixing of material from reservoirs separated by thousands of kilometers in the upper and lower mantle. But if there are no mantle plumes, then all of that mixing must have happened within the upwellings and nearby mantle in Earth's top 1,000 kilometers. A new kind of organic molecule has been discovered in a giant gas cloud in interstellar space, indicating that more complex molecules – the very core building blocks of life – can potentially form outside of the Earth and even be widespread in space. The analysis of a star-forming gas cloud some 27,000 light years away from Earth, published in the journal Science, detected an iso-propyl cyanide molecule with a unique structure that is common in life-forming molecules, such as amino acids. Our goal is to search for new complex organic molecules in the interstellar medium,” he said. And the evidence suggests their presence could actually be widespread. “The enormous abundance of iso-propyl cyanide suggests that branched molecules may in fact be the rule, rather than the exception, in the interstellar medium,” stated Robin Garrod, an astrochemist at Cornell University and a co-author of the paper, according to astrobiology.com. Previously discovered organic molecules, like vinyl alcohol and ethyl formate, all shared a major structural characteristic: the atom carbons they consist of are arranged in one, more or less, straight line. So the finding of iso-propyl cyanide – the largest and most complex molecule discovered to date – is significant according to a Cardiff university astronomy professor. “There seems to be quite a lot of it, which would indicate that this more complex organic structure is possibly very common, maybe even the norm, when it comes to simple organic molecules in space,” Professor Matt Griffin, head of the school of physics and astronomy at Cardiff University said. The finding is already a breakthrough, but what scientists really hope to discover is actual amino acids. “It's a step closer to discovering molecules that can be regarded as the building blocks or the precursors… of amino acids,” Griffin said. Now the discovery of hundreds of methane seeps on the seafloor along the U.S. East Coast suggests that such reservoirs may be more common along passive margins than previously thought. The easily accessible region may prove to be an ideal natural laboratory for studying how such seafloor methane may influence water temperatures and ultimately climate. Methane is often found naturally leaking from the seafloor, particularly in petroleum basins like the Gulf of Mexico or along tectonically active continental margins like the U.S. West Coast, but such plumes were not expected along passive margins, like the east coast of North America, says Adam Skarke, a marine geologist at Mississippi State University and lead author of the new study in Nature Geoscience. This is a giant discovery. But it will of course be ignored by the global warming religious movement. Long-term orbital wobbles drive changes in sand patterns on Saturnian moon. Wind patterns have imprinted a record of the changing climate on the hydrocarbon dunes of Titan. Long sand dunes that ripple across Saturn’s moon Titan may have been there for thousands of years, results from NASA’s Cassini spacecraft suggest. Radar images of the dunes — the most detailed ever taken — reveal that the winds that rearrange the sand probably change direction as Titan's orbit wobbles relative to the Sun. Those orbital variations are thought to alter which parts of the surface get the most sunlight, and the shape of the dunes reflect the resulting changes in weather patterns. It may take as long as 3,000 Saturn years, or 90,000 Earth years, for a single dune to change direction, says Ryan Ewing, a geologist at Texas A&M University in College Station, who led the work. The discovery appears on 8 December in Nature Geoscience1. Some large dunes on Earth, such as those in the western Sahara Desert, also preserve a memory of past climate change. Winds were stronger during the last Ice Age, when Earth’s wobbling orbit allowed glaciers to advance towards the subtropics and altered weather patterns there. The largest dunes formed during that time have not changed orientation in the intervening 11,000 years. Radar mapping by the Cassini probe shows small, star-shaped dunes next to long ones. Scientists have had a harder time pinning down the factors that shape Titan’s dunes. These are made of hydrocarbon particles — so they are more similar to mounds of soot than to Earth's sand, which is mostly silica — and are some of the biggest in the Solar System. They stretch for hundreds of kilometres over a total area as big as the United States (including Alaska). Various ideas for what shaped them include winds from the east or the west, which may be driven by daily, seasonal or other regular changes. Dunes can even assume different forms depending on how much sediment is available to feed them2. Ewing’s team analysed about 10,000 dune crest lines mapped by a radar instrument aboard Cassini, which has been orbiting Saturn since 2004. They used an algorithm that enabled them to extract finer detail from the images than ever before. This sharper view allowed them to see features down to about 1 kilometre across — including, for the first time, star-shaped dunes where three or more crest lines intersect. Ewing, R. C., Hayes, A. G. & Lucas, A. Nature Geosci. http://dx.doi.org/10.1038/ngeo2323 (2014). Lucas, A. et al. Geophys. Res. Lett. 41, 6093–6100 (2014). Burr, D. M. et al. Nature http://dx.doi.org/10.1038/nature14088 (2014). I'm a little late to the party, but this boilerplate consensus statement strikes me as glaringly false. I'm no expert in any field but I try to be a logical thinker: There is no crushing pressure at the earth's core. Gravity at the center of the earth is effectively zero. At the surface we feel gravity pull us down, and we mathematically average the source of that pull to be the geometric center of the earth. Every particle of the earth is attracting every particle of my body and the net result is a line of force straight down towards the center. However, if I was (somehow) at the center of the earth, the entire mass of the planet is 'above' me in all directions. The net attraction cancels itself out and I feel weightless. More evidence that something else is warming the planets, including our earth, than "greenhouse gasses". That is, if methane is or isn't involved with the measured planetary heating, we now have evidence that it isn't necessarily the methane produced by humans. For instance, the sea floor, and cows, produce methane. It is a big discovery; but how do the rest of you see the results? We have sufficient evidences that majority of commercially interesting hydrocarbons have been expelled from organic rich source rock and are trapped in the reservoir rocks. We also have the evidences showing presence of biological molecules in all commercial oils. We have observed the abundance of similar hydrocarbons on many other planetary bodies viz. comets and moons (eg. Titan) etc. which are thought to have been formed without any involvement of any biological material . The common association of hydrocarbons with the inert gas helium is also not explainable in current theory of biotic origin of petroleum. We have observed presence of some traces element like V, Ni, Cu, Co, Zn.. etc in hydrocarbons which also do not clearly explain the biotic origin of petroleum ( szatmari et al,2005). According to the author of the paper ,they have analyzed 68 Brazilian oil and nine foreign oils and determined 24 metal traces in the oils showed fine correlation of the oils with CI chondrite and mantle peridotites, and worse correlation with oceanic and continental crust, and none with seawater. No doubt, the biotic theory has some important evidences but on the other hand the followers of abiotic theory also have strong evidences which cannot be denied. So we require a new theory that can reconcile the strong evidences of both the current theories. Taking strong evidences of both the theories we can easily conclude it. Majority of commercially interesting hydrocarbons accumulations have been formed from the organic rich sedimentary source rocks but essentially from those which has been formed with the involvement of abiotic hydrocarbons. And these abiotic hydrocarbons were once hugely present on the surface of the earth in past geological time. Sedimentary rocks that have been formed without any involvement of these abiotic hydrocarbons are not suitable to form commercial hydrocarbons deposits. So abiotic sources are the major contributor in the commercial accumulations of hydrocarbons. Hence a well balanced theory is today’s major requirement which will help future hydrocarbon exploration efficiently.